Despite being completely dominated in the first half, the Bombers were able to bring some respectability to the scoreline by outscoring the Pies by seven points in the second half. The Pies have scored 74 points from turnovers, above their season average of 48.5. They have scored 68 points from stoppages, above their season average of 21.3. Alex Fasolo has achieved his career high for score involvements with 11, beating his previous best of 10 in round two this year. 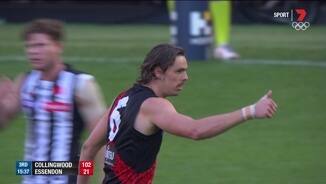 The Bombers have kicked their third goal for the term, all of which have been launched from stoppages. The Bombers have won nine of the last 10 clearances. Bombers InterchangeDavid Zaharakis off due to an injury. The Bombers showed improvement in the third term, managing to draw the quarter with scores locked at 5.2 (32). M. Hartley has taken six intercept marks, the most so far today. The Pies are leading the contested marks 16 to three. Reid leads all comers with three. Collingwood has taken 11 marks inside 50 to Essendon's five. Essendon has launched six of its seven scores from Collingwood turnovers. The Bombers have come out of the blocks quickly after half time, generating 1.1 (7) from two inside 50s. Sidebottom and Pendlebury have both continued their first quarter form. Pendlebury has 23 disposals and eight score involvements. 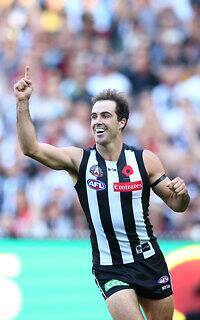 Sidebottom has 20 disposals, four goals and 11 score involvements. The Pies are plus 22 in the contested possession category. 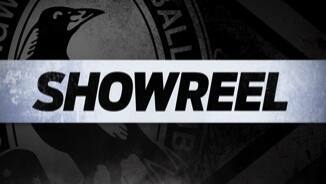 Magpies InterchangeTravis Varcoe and is possibly out for the game. The Bombers are leading inside 50s this term seven to six after losing the count in the first term 17 to 11. 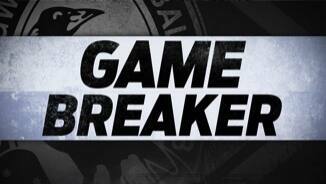 The Bombers have scored both of their goals from Collingwood turnovers in the defensive half. The Pies have kicked their fifth goal launched from a stoppage, they have now scored 10 more points from this source than their season average. S. Sidebottom put on a show in the first term with nine disposals, three goals and six score involvements. Collingwood has scored 5.3 (33) from Essendon turnovers. It averages 48.5 points from this source. S. Pendlebury has started the game with eight disposals, three inside 50s and four score involvements. The Pies have had a dominant start to the game with eight of the first 10 inside 50s. 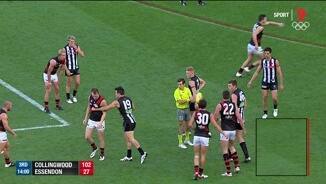 Collingwood's first two goals were launched from stoppages. It averages 21 points from this source per game, ranked 15th. Collingwood has won the first five clearances of the game. Collingwood has been in front for just 9 per cent of game time this season, this is the lowest percentage of any side this season. Essendon has recorded 101 uncontested marks per game this season, six more than any other side. Welcome to MCG for the Collingwood v Essendon Round 5 clash. THE SIEGE engulfing Collingwood has lifted after the Magpies got their spluttering season back on track with a 69-point thumping of Essendon in an Anzac Day fizzer at the MCG. On a magnificent day for football, the Pies rose to the occasion after weeks of intense scrutiny and made a mockery of expectations that the depleted Dons might seize the opportunity to cause a boilover. Nathan Buckley's men split the match wide open with their best first term against Essendon, an 8.4 (52) blitz, on the way to a 22.10 (143) to 11.7 (73) triumph. Essendon narrowly avoided suffering the biggest Anzac Day loss – still the Bombers' 73-point defeat in 2008 – by winning the second half by seven points, but it offered little solace. Steele Sidebottom took home the Anzac Day Medal after bagging four majors and running rampant against the listless Bombers, whose worst fears were realised on the biggest stage without the 12 experienced players serving doping bans. Banished Pies spearhead Travis Cloke was a forgotten figure as a giant American ignited Collingwood, with cult figure Mason Cox marking a dream debut by slotting the game's opening goal with an ice-cold 25m set shot. The 211cm Dallas native was swamped by his teammates, and from there the Pies swarmed all over the overawed Bombers – 14 of whom were making their first appearance in the April 25 showpiece. 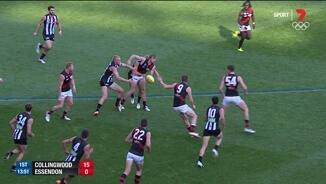 Essendon was ranked second in the AFL for uncontested possessions leading into the match, but John Worsfold's charges simply couldn't get their hands on the ball in the face of white-hot Pies pressure. Knowing their season was slipping away at 1-3, the Pies chased, tackled and harassed the inexperienced Dons into turnover after turnover, never allowing the Bombers to settle into the contest, as Buckley's men breathed life into their campaign. Sidebottom kicked three of his majors in the opening term to end any fears of an upset, while skipper Scott Pendlebury (35 disposals) was in everything, showcasing the poise and class that Essendon sorely lacked. The Bombers (1-4) remarkably matched the Pies for inside 50 entries (27-all) at half-time, but the quality of the supply going was worlds apart as Collingwood kicked 14 goals to two. "We were able to defend well enough but we were actually scoring pretty heavily from our inside (50s), so it's a pretty simple game when you get those elements right," Buckley said. Dons spearhead Joe Daniher, often outnumbered, had a dirty day with one kick to the main break and one goal for the match. At the other end, Cox crashed packs, was nimble on the deck and finished with 10 touches, 11 hit-outs and 1.1. Adam Treloar (32 possessions) continued his great start in black and white, with strong support from Taylor Adams (36) and first-gamer Josh Smith (23). Orazio Fantasia (25 touches, two goals) was his side's best player, while ex-Geelong star James Kelly (29 disposals) made the most of his one and only Anzac Day appearance and defender Michael Hartley battled against the odds. After his first involvement on Anzac Day, Bombers coach John Worsfold said his side didn't step up to the occasion when the heat was on. "That first half was really disappointing from a lot of viewpoints. 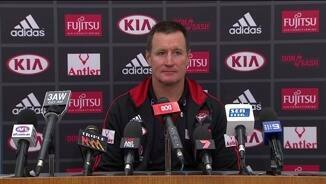 We were pretty disappointed with ourselves at half-time," Worsfold said post-match. 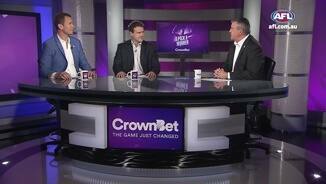 "I thought they did (have a crack in the second half). Not to the level that we outscored them by a lot, but we played a lot better footy in the second half – more like the style of footy we're trying to play consistently." 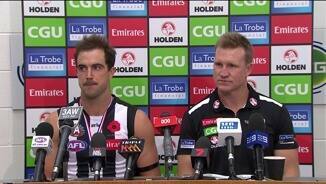 The Pies' victory continued their recent dominance of Anzac Day. They've now won nine of the last 11 contests, and 13 of the 22 blockbuster matches overall. While a much bigger challenge awaits against West Coast, Buckley's men will at least fly west with some renewed belief and a chance to push back towards a finals berth that looked so attainable during the pre-season. However, Collingwood might have to take on the Eagles without Travis Varcoe (hamstring), while Levi Greenwood could be in Match Review Panel trouble after he was reported for striking Brendon Goddard. Collingwood: The big blow was Travis Varcoe, who didn't feature after half-time and looks doubtful for the Eagles next week after "disrupting" his troublesome hamstring. Taylor Adams (knee) and Josh Smith needed early treatment but played out the match. Essendon: Orazio Fantasia had attention on his quad in the first term but returned to be one of his side's best. The Bombers appeared to get through unscathed. 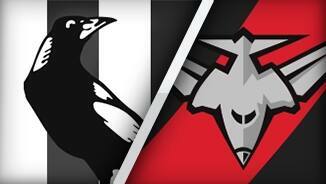 The Pies fly west for a daunting task against a West Coast side on the rebound from another disappointing effort away from Domain Stadium. Essendon needs to lift for a potential battle to avoid the wooden spoon against Carlton.